welcome to the quilter's blog hop party! if you're a new visitor, let me tell you a little bit about what goes on around here. i post a lot about quilting, usually blocks for different bees, and i have a vintage sheet addiction. i share my VS fabric finds in my etsy shop. i post recipes, and write about my family and crafting with kids. we have an 8 year old daughter, and three boys, ages 6, 5, and 2. i'm a lucky stay at home mom, and most days you'll find me in my pjs. i'm planning some DIY/home improvement posts too, so if you're not a follower, i'd love it if you join me! let's get on to the real reason you're here, the giveaway! i decided to offer up 3 fat quarters of fabrics. these are fun prints i bought before i knew if i was having a niece or nephew (and it's a niece). the stripe is riley blake's peak hour stripe, next is riley blake alphabet soup beads in blue, and then argyle in green. i love how well the fabrics work together! add in some solids and you have a fun mod baby quilt. thanks to michele and the quilting gallery for hosting this fun event! happy 5th birthday! have a great time checking out the other blogs, and thanks for stopping by! My kids are in their 20's now, but they still come home and stay all night on Christmas eve. We even still leave a letter for Santa. We have everyone here on Christmas eve for gift sharing. We make Christmas cookies as a family. The kids decorate and the adults bake (and taste test). I cook Christmas Eve dinner and then we go to a Moravian service. After at mom and dads we bring in the presents and stuff the stockings. We open our Christmas eve pjs. We open one present on Christmas eve. M husband's family celebrates and opens gifts on Christmas Eve and we celebrate with my family on Christmas Day. Thank goodness it worked out that way! We have done lots of different things on Christmas Eve. This year we are going to the bonfires on the levee in Gramercy, LA. We've been once before and it is a really unique and enjoyable event. We have dinner and open one present (if you want to). I love the fabric! I even like the selvage, hehe. I'm saving my selvages for a project in the future. We don't really have any particular tradition on Christmas Eve, but we all make sure the family is together. Thanks for the great giveaway! The whole family comes over for a buffet sytle dinner then we open our presents. Even though everyone is grown Santa still leaves one or two gifts under the tree for anyone that stays the night. What's really funny is that no matter how late Santa has to stay up to put the gifts under the tree there always seems to be unexplained gifts for her under the tree in the morning. Maybe there really is a Santa. We open our Christmas stockings right before we go to bed on Christmas Eve after we come home from church. My husband and I go on a road trip to visit relatives as soon as he gets out of work prior to Christmas(Friday this year). Christmas Eve is for my immediate family now (kids out of grad school and one in college) then we go to family parties on Christmas Day! Lots of fun! thank you! We live in a resort community, so have the unique opportunity of watching a torchlight parade of skiers come down one of our ski hills. This is followed by fireworks, Christmas carols, hot chocolate and cookies. Then we head home for a nice Christmas Eve dinner before we settle down for our long winter's nap! We always open one gift and it's always pajamas. We also read the Christmas story from the bible. Great fabrics for the giveaway! We usually have a nice dinner on Christmas Eve. Normally, we spend the evening with my dad's family and have a white elephant gift exchange. =) Thanks for a chance to win. We spend Christmas Eve at my father-in-law's place. He's from Switzerland so he loves quiche and a spinach salad. Then we open gifts. When our girls were younger we had to convince them that Santa stopped the night before at Grandpa's house. We go to the Christmas Eve service at my church and have a nice family dinner after! We also open up one present each on Christmas Eve before bed. We each get one package to open on Christmas Eve (parents & children alike) -- Christmas P.J.s, and then we put those on and sit together to read The Night Before Christmas. Of course we leave out cookies and milk before we/the kids head to bed! I thoroughly enjoyed reading everyone's traditions. I resist tradition and try to do something new every year. This year it is to drive through the race track viewing the light display. I am due with a baby in April and don't know if it will be a boy or a girl. I always go to a Christmas Eve service where they have live animals and lots of singing. Then my husband's family all come over to our house to eat, drink and just have fun. We have always celebrated with my husband's parents on Christmas Eve and my family on Christmas Day. Now that my parents are gone my husband and I just sound the day together. Thanks for the giveaway. I grew up with my parents letting us open one presant on Christmas eve. I expanded that with my kids and let them open everything - that way I could sleep late on Christmas. We always get a new pair of pajamas on Christmas eve! I'm all about DIY so I think I am going to love this blog! Thanks! Your fabric sure would makea great lap quilt for my grand newphew. I am a follower of your blog and follow on Facebook as well. Thank you for the chance to win those fabrics and Merry Christmas. On Christmas Eve we have homemade oyster stew. My mom always bought us a new ornament for the tree each year so now I do that with my kids! Watching A Christmas Story. Thanks for the chance! Watching It's A Wonderful Life! Thanks for being part of the blog hop. really don't have a tradition, but we do love to watch Christmas movies. Thanks for being part of the blog hop. I'm a new follower. Thanks for being part of the blog hop. On Christmas Eve we have a soup supper and Santa comes with the kid's gifts. Haven't figured out yet how he sneaks in!! Christmas Eve we always go to my Aunt's house. When we get home my kiddos put their cookies and letters out for santa. We spend Christmas eve with my dad's family and go to church together! Thanks for chance to win your Drawing! On Christmas Eve we have a taco feast then read the Christmas story from the Bible, followed by Christmas carols and finally, presents! I always make a gingerbread house with my girls on Christmas Eve. We have a big dinner complete with Christmas crackers. Dessert, then Jammie's, a Christmas show for the littles and a plate of cookies for Santa. Cuddles under a quilt for our last family read aloud of the season: 'twas the Night Before Christmas. Our Christmas tradition is the meal we eat on Christmas Eve. (Our kids are married and go to in-laws on Christmas day) sew, we do Eve. We have sheep dip and baked potatoes. I bet your wondering what sheep dip is!!! We open gifts on Christmas Eve one by one youngest to oldest. Love it! Thanks for a great giveaway. We have a birthday cake for Jesus. We do usually go out in the afternoon and hand deliver baked goodies to the neighbors and freinds. Our Christmas eve tradition is to eat posole together and then go to Midnight Mass! My DH makes beef enchiladas for Christmas Eve dinner. Thanks for the great giveaway! Merry Christmas! We really don't have any holiday traditions. I lovce baking cookies on Christmas Eve. I used to spend Christmas Eve with my extended family. Now that we all have families of our own, we can't all fit in one place! We go to church on Christmas Eve! Thanks for the giveaway! As a kid, after church, we would get a pizza and drive around looking at Christmas lights. My son is too young this year...but mabe next year! We do Chinese buffet and then church on Christmas eve. We attend mass on Christmas Eve. Following the service, we have dinner or dessert with neighbors. We open gifts on Christmas morning. Thanks for the colorful giveaway! We open gifts on Christmas Eve. Of course there is something from Santa the next morning. Being with family! Thanks for the chance to win!! Spending time with family! My husband and I don't have any kids yet but when we do I would love to build gingerbread houses with them on Christmas Eve. Candlelight services followed by our evening meal and then on to opening gifts. Thanks for the chance at your giveaway. Church with the family, then something homemade ravioli for dinner. We go to mass on Christmas eve at 10pm or midnight and then open one present afterwards. This year I think we're going to have pizza for dinner too, with my husband's brothers and sisters. On Christmas eve we go to the candlelight service at church and hope the kids don't set our hair on fire. It is always a close call! The kids come by for our favorite finger foods and we attend midnight mass. 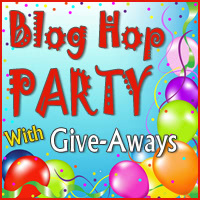 Thanks for participating in the blog hop party! We have a big family meal Christmas Eve. The little kids get to open their new pjs. Christmas Eve we have a family dinner, program and act out the nativity. After extended family leave, immediate family open one present, grandma's pjs, we read a story, have prayer, hugs all around and go to bed. Lots of talking, laughing and loving throughout the evening. Thanks. We open gifts on Christmas Eve! We go look at Christmas lights and get open one present on Christmas Eve, new pajamas. We have a family dinner celebration with my mom's side of the family on Christmas eve. Thanks for the giveaway! We like cuddling in close and watching a good Christmas movie before bed. We always try to have our Christmas when we can all be here. Once it was in the middle of Jan! WE go to my parents and have Christmas with the family. Yes we do, Christmas Eve at our grandson's and reading The Night Before Christmas to him and my granddaughter over the phone. Our family drives through the neighborhoods that put out luminaries on CHristmas eve. Our church is usually open for families to come for communion. We do this and then drive around singing carols and looking at lights. Then home for a mug of hot chocolate and the night before christmas poem. We used to buy the little kids a new pair of pj's for them to open on Christmas eve. Now that they're grown they get to open a new book. I am a new follower. I look forward to getting to know you through your blog. Our tradition is to have a HUGE breakfast before we open gifts. That way everyone is wide awake. My kids are older so they don't mind waiting! We drive around to look at Christmas lights in town. We almost always have grilled cheese sandwiches. Then the Christmas cookies come out! We read the night before christmas and the nativity story. Then cookies/milk for santa and bed. Thanks for the giveaway, merry christmas. When the kids were little, we always opened one present on Christmas Eve. The kids loved this. favorite tradition is decorating gingerbread houses with my grand kids..
New follower-- thanks, I like what I see here so far! Christmas eve tradition: Usually mellow, hanging out by the fire (if it's cold enough here in SoCal), playing board or card games, and everyone opens one gift. Candlelight service in the late afternoon. The family goes to the candlelight service at our church. thanks for the give away. The fabrics would make a great little quilt. Our Christmas Eve Tradition is going to church and then home to hot cocoa and cookies. A Candle light service in our church. Always good, and always interesting. How does Rafflecopter work? Christmas Eve tradition - late watching the service at the Vatican and wrapping presents. Since my kids were waaay little, we always planned a Christmas Eve play, songs, etc. It was always so fun. We've lost some relatives through the years so there aren't as many family left to see the play. The "kids" are now 26, 27, and 29, and they still come up with scripture readings, songs, and a well-produced program. I can't wait til this year's play. Candlelight service that ends with Silent Night. So peaceful. We open one present on Christmas Eve and open the rest in the morning. Thanks for the chance to win. Love the fabric you picked!